NEXCOM digital signage player NDiS B535 is design to help increase sales, build customer loyalty, and optimize floor design for retail stores. Featuring 6th generation Intel Cor processor, the fanless digital signage player is outfitted for stores which can reach out to customers through personalized in-store offers, help monitor on-shelf availability, and track foot traffic. To equip a responsive store with capabilities to respond to its environment and customers, NEXCOM NDiS B535 provides intelligence with quad-core Intel Core™ i7-6700TE or i5-6500TE processor, built-in Intel HD Graphics, and support for 32GB of DDR4 2133 memory with its dual socket configuration. Capable of parallel, intensive data- and graphic-processing, the digital signage player can run in-store promotions while pushing membership rewards to nearby mobile devices, detecting foot traffic and customer demographics, and conducting inventory counts in the background. 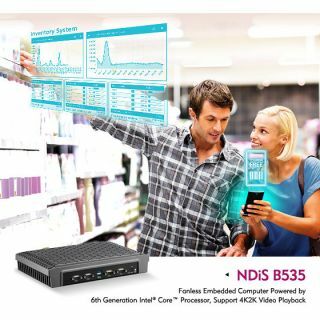 For in-store promotions, NEXCOM NDiS B535 supports 4K2K contents with the unified display output of three HDMI 2.0 ports, accelerated media codecs including HEVC, and the latest API support such as Microsoft DirectX 12 on Windows 10. To interplay with its surroundings, the digital signage player has a set of interfaces to connect to IP cameras, product tags, and ambient detectors. These interfaces include LAN, COM, and USB 3.0. M.2 and mini-PCIe are provided for storage and Wi-Fi/Bluetooth expansion. NEXCOM NDiS B535 also enables integration with retail systems. With network connectivity, in-store data put together by the digital signage player can be uploaded to retail systems.